It's been a few weeks since I brought you the fancy on Fridays, I know. But what with two baseball games every Thursday night and Spring Break and then that little pill called Halcion that I had to take again last Thursday when I FINALLY had the second half of the root canal on number 13, I've just found it difficult to find time to get the fancy on. Do y'all remember me telling you about how the first time the Halcion made me sleepy but that I remembered everything and really didn't get that loopy? Yeah, well not so much this time. This time the room started to spin a bit before we'd even left the house and seems I recall mumbling to the endodontist and his assistant, (when they said something about how long the root of my tooth was for a person of my size...or maybe they said for the size of my mouth..who knows?) that my feet (size 8) are also big and how I believe that something stunted my growth (I'm 5 '4") along the way and that I should have actually been taller. Yes, I did. And I have to go back on May 26th to have number 19 done. Super. Anyway, I hadn't planned to come here today to talk about root canals and Halcion highs but seems I always find myself going down that road now when I try to compose a Fancy Friday post and I'm not sure why that is. Probably because I was about to compose one on the day I got the phone call telling me I needed the root canals and now I'm like Pavlov's dog. Did someone say 'Fancy Friday'? Ding-Ding-Ding! "Root canal"! I want to talk today about my summer must-haves, the things that I have discovered over the years that I just can't live without during the summer months. Okay, I know I actually probably could but I really wouldn't want to. First up is my good friend, the self-tanner. I used to be all about a good summer tan. The real thing. Until I got that little bit of skin cancer on my chest a few years ago and now I'm all about the sunscreen and the self-tanner. My favorite is Jergen's Natural Glow Daily Moisturizer. It is the bomb and does not streak like many of the others I've tried. Plus, you can buy it everywhere from Target to CVS and it's pretty inexpensive. Just $7.89 at Target. But in the summer months, if I'm going to be outside much I like the Ultra Sheer SPF 45 Dry-Touch Sunblock for all over protection. It never feels greasy and it's waterproof. I love, love, love my Old Navy flip flops and usually get two or three new pairs every summer. They come in every color imaginable and only cost $3.50 a pair or $2.50 when you buy more than one. And I haven't had one break on me yet. You just can't beat them for the price. I just about live in capri pants in the summer. I have them in several different colors but my favorites are the lightweight cargo capris from the Loft. And sorry but you'll have to click the link to see them because the Loft's photos are not cooperative in the least. A Lightweight Cardigan is another summer must-have for me and I kick myself every time I forget to take one along to a restaurant because about 98% of restaurants seem to keep the A/C set on 60 degrees which turns me into a crabby, little old lady all hunched over, shivering and complaining about the misery of my situation. Please tell me I'm not the only one. I'm pretty sure I talked about the Wallaroo hats here before but that was like a year ago when only two people were reading this blog. As opposed to the eight of you who are reading it now. And Thank You, by the way. I love you all! 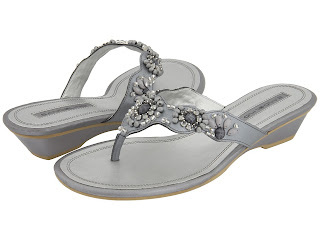 When I want something a little fancier than my Old Navy flip flops in the summer, I almost always go for a cute pair of thong sandals, like this Bandolino pair. I actually have these in black and they are surprisingly very comfortable. And that is all I have for you today since blogger has been on the fritz since yesterday afternoon. I may just break down and talk about swimsuits next week. Or at least cover ups. That cardigan is super cute. I love the color! I totally related to a couple of things in your blog. 1) I'm going to an endondontist on Monday for an evaluation on whether or not we can save a tooth that, years ago, had a root canal done THROUGH a permanent crown. Not looking forward to hearing the news about that. 2) Why are restaurants SO daggone cold in the summer?? Remember the post I wrote a few weeks ago about visiting Cracker Barrel without a jacket and buying a hoodie??! you've had 13 root canals? what the? i'm so excited for flip flop weather!!! woot woot. I found you through airing my dirty laundry. I have a TON of Old Navy flip flops. Love them! I also like that Jergen's stuff, except for when you stop using it and it fades all blotchy and weird. I had to kinda giggle at your stunted growth comment while under the influence, but I'm sorry you're going through so much crap! I'm loving that cardi - I just bought one at Target b/c I was desperate, but I think I'm taking it back. That Old Navy one is much cuter! After our beach disaster over Easter, I need to stock up on sunscreen! I have a tendency to babble like that when in similar situations... so embarrassing! 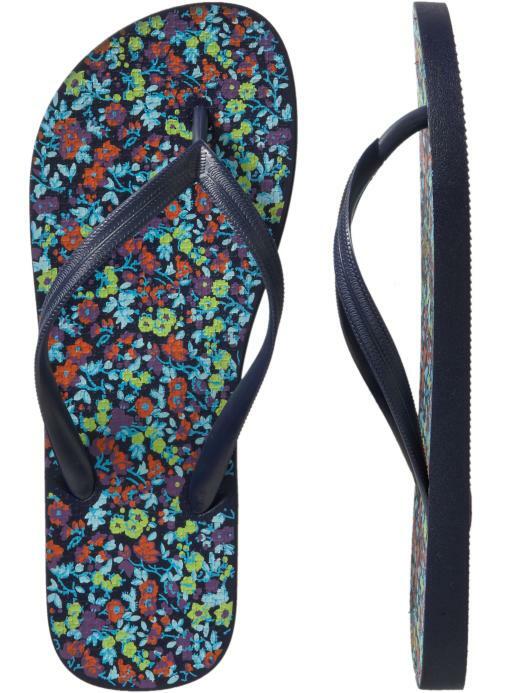 I also need to get The Girl a new pair of flip flops... guess we'll be checking out Old Navy!